Back in the immoral age of comics, Christian comedians seemed out of place in any other venue besides a church. Some would argue that the only thing that goes on in a church is comedy, but that would be going for the cheap laugh and I would never do that. Aren’t all comedians Immoral? (“deliberately violating accepted principles of right and wrong“) The basic job definition is holding up a fun-house mirror to society & letting people consider ideas that they would never think of otherwise. It would be hard to come up with a bigger violation of currently accepted principles of right and wrong than humbly pursuing your faith, loving your God and your fellow man even over the pursuit of material gain. Thus Christianity can be pretty damn immoral. When the late Mr. Carlin went on about the seven dirty words that you can’t say on television he was making a point about the unpleasantness of swearing serving to distract us from the true obscenities of the world like poverty, war, bigotry. For me that’s a very Christian message. “As you’ve never seen them?” Well, that’s setting the bar pretty low. How about as you’ve never heard of them? And just FYI: Bob Newhart is GOD! 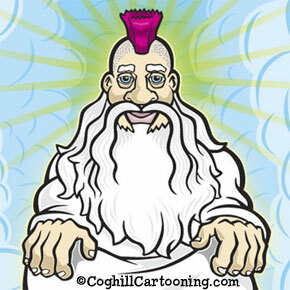 Punk god illustration by George Coghill. May I propose a homonym here? “faith baste organization.” Not sure whether you want the hyphen here. Maybe they do baptisms. Or, um, immaculate conceptions — you know, with one of those lesbian wedding present things?